… You will herewith receive the result of the Convention, which continued its Session till the 17th. of September. I take the liberty of making some observations on the subject which will help to make up a letter, if they should answer no other purpose. It was generally agreed that the objects of the Union could not be secured by any system founded on the principle of a confederation of sovereign States. A voluntary observance of the federal law by all the members, could never be hoped for. A compulsive one could evidently never be reduced to practice, and if it could, involved equal calamities to the innocent & the guilty, the necessity of a military force both obnoxious & dangerous, and in general, a scene resembling much more a civil war, than the administration of a regular Government. This ground-work being laid, the great objects which presented themselves were 1. to unite a proper energy in the Executive and a proper stability in the Legislative departments, with the essential characters of Republican Government. 2. to draw a line of demarkation which would give to the General Government every power requisite for general purposes, and leave to the States every power which might be most beneficially administered by them. 3. to provide for the different interests of different parts of the Union. 4. to adjust the clashing pretensions of the large and small States. Each of these objects was pregnant with difficulties. The whole of them together formed a task more difficult than can be well concieved by those who were not concerned in the execution of it. Adding to these considerations the natural diversity of human opinions on all new and complicated subjects, it is impossible to consider the degree of concord which ultimately prevailed as less than a miracle. The first of these objects as it respects the Executive, was peculiarly embarrassing. On the question whether it should consist of a single person, or a plurality of coordinate members, on the mode of appointment, on the duration in office, on the degree of power, on the re-eligibility, tedious and reiterated discussions took place. The plurality of co-ordinate members had finally but few advocates. Governour Randolph was at the head of them. The modes of appointment proposed were various, as by the people at large–by electors chosen by the people–by the Executives of the States–by the Congress, some preferring a joint ballot of the two Houses–some a separate concurrent ballot allowing to each a negative on the other house–some a nomination of several canditates by one House, out of whom a choice should be made by the other. Several other modifications were started. The expedient at length adopted seemed to give pretty general satisfaction to the members. As to the duration in office, a few would have preferred a tenure during good behaviour–a considerable number would have done so, in case an easy & effectual removal by impeachment could be settled. It was much agitated whether a long term, seven years for example, with a subsequent & perpetual ineligibility, or a short term with a capacity to be re-elected, should be fixed. In favor of the first opinion were urged the danger of a gradual degeneracy of re-elections from time to time, into first a life and then a heriditary tenure, and the favorable effect of an incapacity to be reappointed, on the independent exercise of the Executive authority. On the other side it was contended that the prospect of necessary degradation, would discourage the most dignified characters from aspiring to the office, would take away the principal motive to the faithful discharge of its duties–the hope of being rewarded with a reappointment, would stimulate ambition to violent efforts for holding over the constitutional term–and instead of producing an independent administration, and a firmer defence of the constitutional rights of the department, would render the officer more indifferent to the importance of a place which he would soon be obliged to quit for ever, and more ready to yield to the incroachmts. of the Legislature of which he might again be a member. The questions concerning the degree of power turned chiefly on the appointment to offices, and the controul on the Legislature. An absolute appointment to all offices–to some offices–to no offices, formed the scale of opinions on the first point. On the second, some contended for an absolute negative, as the only possible mean of reducing to practice, the theory of a free Government which forbids a mixture of the Legislative & Executive powers. Others would be content with a revisionary power to be overruled by three fourths of both Houses. It was warmly urged that the judiciary department should be associated in the revision. The idea of some was that a separate revision should be given to the two departments–that if either objected two thirds; if both three fourths, should be necessary to overrule. In forming the Senate, the great anchor of the Government, the questions as they came within the first object turned mostly on the mode of appointment, and the duration of it. The different modes proposed were, 1. by the House of Representatives 2. by the Executive, 3. by electors chosen by the people for the purpose. 4. by the State Legislatures. On the point of duration, the propositions descended from good-behavior to four years, through the intermediate terms of nine, seven, six, & five years. The election of the other branch was first determined to be triennial, and afterwards reduced to biennial. The second object, the due partition of power, between the General & local Governments, was perhaps of all, the most nice and difficult. A few contended for an entire abolition of the States; some for indefinite power of Legislation in the Congress, with a negative on the laws of the States: some for such a power without a negative: some for a limited power of legislation, with such a negative: the majority finally for a limited power without the negative. The question with regard to the Negative underwent repeated discussions, and was finally rejected by a bare majority. As I formerly intimated to you my opinion in favor of this ingredient, I will take this occasion of explaining myself on the subject. Such a check on the States appears to me necessary 1. to prevent encroachments on the General authority. 2. to prevent instability and injustice in the legislation of the States. 1. Without such a check in the whole over the parts, our system involves the evil of imperia in imperio. If a compleat supremacy some where is not necessary in every Society, a controuling power at least is so, by which the general authority may be defended against encroachments of the subordinate authorities, and by which the latter may be restrained from encroachments on each other. If the supremacy of the British Parliament is not necessary as has been contended, for the harmony of that Empire; it is evident I think that without the royal negative or some equivalent controul, the unity of the system would be destroyed. The want of some such provision seems to have been mortal to the antient Confederacies, and to be the disease of the modern. Of the Lycian Confederacy little is known. That of the Amphyctions is well known to have been rendered of little use whilst it lasted, and in the end to have been destroyed by the predominance of the local over the federal authority. The same observation may be made, on the authority of Polybius, with regard to the Achaean League. The Helvetic System scarcely amounts to a Confederacy, and is distinguished by too many peculiarities, to be a ground of comparison. The case of the United Netherlands is in point. The authority of a Statholder, the influence of a Standing army, the common interest in the conquered possessions, the pressure of surrounding danger, the guarantee of foreign powers, are not sufficient to secure the authority and interests of the generality, agst. the antifederal tendency of the provincial sovereignties. The German Empire is another example. A Hereditary chief with vast independent resources of wealth and power, a federal Diet, with ample parchment authority, a regular Judiciary establishment, the influence of the neighbourhood of great & formidable Nations, have been found unable either to maintain the subordination of the members, or to prevent their mutual contests & encroachments. Still more to the purpose is our own experience both during the war and since the peace. Encroachments of the States on the general authority, sacrifices of national to local interests, interferences of the measures of different States, form a great part of the history of our political system. It may be said that the new Constitution is founded on different principles, and will have a different operation. I admit the difference to be material. It presents the aspect rather of a feudal system of republics, if such a phrase may be used, than of a Confederacy of independent States. And what has been the progress and event of the feudal Constitutions? In all of them a continual struggle between the head and the inferior members, until a final victory has been gained in some instances by one, in others, by the other of them. In one respect indeed there is a remarkable variance between the two cases. In the feudal system the sovereign, though limited, was independent; and having no particular sympathy of interests with the great Barons, his ambition had as full play as theirs in the mutual projects of usurpation. In the American Constitution The general authority will be derived entirely from the subordinate authorities. The Senate will represent the States in their political capacity; the other House will represent the people of the States in their individual capac[it]y. The former will be accountable to their constituents at moderate, the latter at short periods. The President also derives his appointment from the States, and is periodically accountable to them. This dependence of the General, on the local authorities, seems effectually to guard the latter against any dangerous encroachments of the former: Whilst the latter, within their respective limits, will be continually sensible of the abridgment of their power, and be stimulated by ambition to resume the surrendered portion of it. We find the representatives of Counties and corporations in the Legislatures of the States, much more disposed to sacrifice the aggregate interest, and even authority, to the local views of their Constituents: than the latter to the former. I mean not by these remarks to insinuate that an esprit de corps will not exist in the national Goverment or that opportunities may not occur, of extending its jurisdiction in some points. I mean only that the danger of encroachments is much greater from the other side, and that the impossibility of dividing powers of legislation, in such a manner, as to be free from different constructions by different interests, or even from ambiguity in the judgment of the impartial, requires some such expedient as I contend for. Many illustrations might be given of this impossibility. How long has it taken to fix, and how imperfectly is yet fixed the legislative power of corporations, though that power is subordinate in the most compleat manner? The line of distinction between the power of regulating trade and that of drawing revenue from it, which was once considered as the barrier of our liberties, was found on fair discussion, to be absolutely undefinable. No distinction seems to be more obvious than that between spiritual and temporal matters. Yet wherever they have been made objects of Legislation, they have clashed and contended with each other, till one or the other has gained the supremacy. Even the Boundaries between the Executive, Legislative & Judiciary powers, though in general so strongly marked in themselves, consist in many instances of mere shades of difference. It may be said that the Judicial authority under our new system will keep the States within their proper limits, and supply the place of a negative on their laws. The answer is, that it is more convenient to prevent the passage of a law, than to declare it void after it is passed; that this will be particularly the case, where the law aggrieves individuals, who may be unable to support an appeal agst. a State to the supreme Judiciary; that a State which would violate the Legislative rights of the Union, would not be very ready to obey a Judicial decree in support of them, and that a recurrence to force, which in the event of disobedience would be necessary, is an evil which the new Constitution meant to exclude as far as possible. 2. A constitutional negative on the laws of the States seems equally necessary to secure individuals agst. encroachments on their rights. The mutability of the laws of the States is found to be a serious evil. The injustice of them has been so frequent and so flagrant as to alarm the most stedfast friends of Republicanism. I am persuaded I do not err in saying that the evils issuing from these sources contributed more to that uneasiness which produced the Convention, and prepared the public mind for a general reform, than those which accrued to our national character and interest from the inadequacy of the Confederation to its immediate objects. A reform therefore which does not make provision for private rights, must be materially defective. The restraints agst. paper emissions, and violations of contracts are not sufficient. Supposing them to be effectual as far as they go, they are short of the mark. Injustice may be effected by such an infinitude of legislative expedients, that where the disposition exists it can only be controuled by some provision which reaches all cases whatsoever. The partial provision made, supposes the disposition which will evade it. It may be asked how private rights will be more secure under the Guardianship of the General Government than under the State Governments, since they are both founded on the republican principle which refers the ultimate decision to the will of the majority, and are distinguished rather by the extent within which they will operate, than by any material difference in their structure. A full discussion of this question would, if I mistake not, unfold the true principles of Republican Government, and prove in contradiction to the concurrent opinions of theoretical writers, that this form of Goverment, in order to effect its purposes, must operate not within a small but an extensive sphere. I will state some of the ideas which have occurred to me on this subject. Those who contend for a simple Democracy, or a pure republic, actuated by the sense of the majority, and operating within narrow limits, assume or suppose a case which is altogether fictitious. They found their reasoning on the idea, that the people composing the Society, enjoy not only an equality of political rights; but that they have all precisely the same interests, and the same feelings in every respect. Were this in reality the case, their reasoning would be conclusive. The interest of the majority would be that of the minority also; the decisions could only turn on mere opinion concerning the good of the whole, of which the major voice would be the safest criterion; and within a small sphere, this voice could be most easily collected, and the public affairs most accurately managed. We know however that no Society ever did or can consist of so homogeneous a mass of Citizens. In the savage State indeed, an approach is made towards it; but in that State little or no Government is necessary. In all civilized Societies, distinctions are various and unavoidable. A distinction of property results from that very protection which a free Government gives to unequal faculties of acquiring it. There will be rich and poor; creditors and debtors; a landed interest, a monied interest, a mercantile interest, a manufacturing interest. These classes may again be subdivided according to the different productions of different situations & soils, & according to different branches of commerce, and of manufactures. In addition to these natural distinctions, artificial ones will be founded, on accidental differences in political, religious or other opinions, or an attachment to the persons of leading individuals. However erroneous or ridiculous these grounds of dissention and faction, may appear to the enlightened Statesman, or the benevolent philosopher, the bulk of mankind who are neither Statesmen nor Philosophers, will continue to view them in a different light. It remains then to be enquired whether a majority having any common interest, or feeling any common passion, will find sufficient motives to restrain them from oppressing the minority. An individual is never allowed to be a judge or even a witness in his own cause. If two individuals are under the biass of interest or enmity agst. a third, the rights of the latter could never be safely referred to the majority of the three. Will two thousand individuals be less apt to oppress one thousand, or two hundred thousand, one hundred thousand? Three motives only can restrain in such cases. 1. a prudent regard to private or partial good, as essentially involved in the general and permanent good of the whole. This ought no doubt to be sufficient of itself. Experience however shews that it has little effect on individuals, and perhaps still less on a collection of individuals, and least of all on a majority with the public authority in their hands. If the former are ready to forget that honesty is the best policy; the last do more. They often proceed on the converse of the maxim: that whatever is politic is honest. 2. respect for character. This motive is not found sufficient to restrain individuals from injustice, and loses its efficacy in proportion to the number which is to divide the praise or the blame. Besides as it has reference to public opinion, which is that of the majority, the Standard is fixed by those whose conduct is to be measured by it. 3. Religion. The inefficacy of this restraint on individuals is well known. The conduct of every popular Assembly, acting on oath, the strongest of religious ties, shews that individuals join without remorse in acts agst. which their consciences would revolt, if proposed to them separately in their closets. When Indeed Religion is kindled into enthusiasm, its force like that of other passions is increased by the sympathy of a multitude. But enthusiasm is only a temporary state of Religion, and whilst it lasts will hardly be seen with pleasure at the helm. Even in its coolest state, it has been much oftener a motive to oppression than a restraint from it. If then there must be different interests and parties in Society; and a majority when united by a common interest or passion can not be restrained from oppressing the minority, what remedy can be found in a republican Government, where the majority must ultimately decide, but that of giving such an extent to its sphere, that no common interest or passion will be likely to unite a majority of the whole number in an unjust pursuit. In a large Society, the people are broken into so many interests and parties, that a common sentiment is less likely to be felt, and the requisite concert less likely to be formed, by a majority of the whole. The same security seems requisite for the civil as for the religious rights of individuals. If the same sect form a majority and have the power, other sects will be sure to be depressed. Divide et impera, the reprobated axiom of tyranny, is under certain qualifications, the only policy, by which a republic can be administered on just principles. It must be observed however that this doctrine can only hold within a sphere of a mean extent. As in too small a sphere oppressive combinations may be too easily formed agst. the weaker party; so in too extensive a one, a defensive concert may be rendered too difficult against the oppression of those entrusted with the administration. 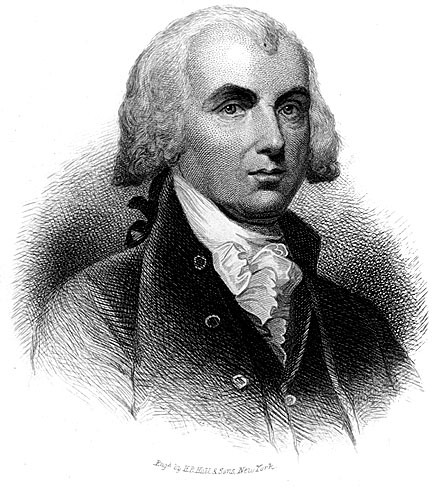 The great desideratum in Government is, so to modify the sovereignty as that it may be sufficiently neutral between different parts of the Society to controul one part from invading the rights of another, and at the same time sufficiently controuled itself, from setting up an interest adverse to that of the entire Society. In absolute monarchies, the Prince may be tolerably neutral towards different classes of his subjects, but may sacrifice the happiness of all to his personal ambition or avarice. In small republics, the sovereign will is controuled from such a sacrifice of the entire Society, but is not sufficiently neutral towards the parts composing it. In the extended Republic of the United States, The General Government would hold a pretty even balance between the parties of particular States, and be at the same time sufficiently restrained by its dependence on the community, from betraying its general interests. Begging pardon for this immoderate digression I return to the third object abovementioned, the adjustment of the different interests of different parts of the Continent. Some contended for an unlimited power over trade including exports as well as imports, and over slaves as well as other imports; some for such a power, provided the concurrence of two thirds of both House were required; Some for such a qualification of the power, with an exemption of exports and slaves, others for an exemption of exports only. The result is seen in the Constitution. S. Carolina & Georgia were inflexible on the point of the slaves. Source: Excerpt from James Madison Letter to Thomas Jefferson dated: 24 October 1787. The Liberty Letters are researched, and edited (with occasional commentary) by Steve Farrell. Liberty Letters as a collective project, and individual letters when edited, or accompanied by our commentary and or introductory notes: Copyright © 2012 Steve Farrell and The Moral Liberal. The original copyright of this James Madison letter is in the Public Domain.